I always think it’s in the starting that a journey takes its shape. How have I come to this point of departure and how did I decide this was the time I needed to travel? How did I get to a place where a 300 km hike in the month of December seemed like the thing to do? And in this case, how in the world was I able to convince my beautiful daughters to trust me long enough to come along? 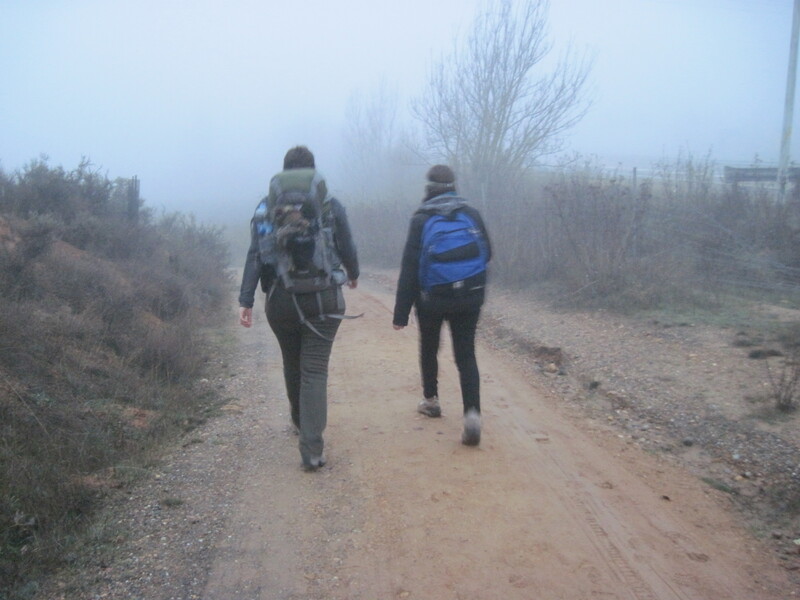 In the early fall of 2012, I had already decided I needed to walk the Camino again. As wonderful as my 2010 trip had been, I felt that I needed to know more, to see more, to do more, so I did some research on flights, and started planning. Initially, I thought I wanted to walk again by myself, just meeting other pilgrims – or not – and having the Camino to myself. But something told me to invite my children, so I made the offer to all four and got two takers: the oldest and the youngest of my three daughters. We left for Madrid after getting lunch near my office at Columbia University where I was working at the time. It felt like we were abandoning the familiar in favor of an adventure, something I didn’t remember feeling the last time. We had shopped together for gear, gone over the itinerary, and packed everything together. We were ready – together. After arriving in Madrid, we had lunch at the train station and then we took off for León, one of my favorite cities in Spain. This is where we started our Camino. León is beautiful and we had made reservations to spend the night at the parador, the Renaissance convent of San Marcos. It sits right on the Camino and the yellow arrows are just off to the right as you exit, but walking from the train station, I couldn’t find it. I’ve never felt so foolish walking in Spain. I had a map that was just not speaking to me, so we went into a bar and asked for directions and eventually found our way. We walked by the Cathedral and even in my jet-lagged, lost state, I knew enough to get inside for a few quick prayers. Spanish churches aren’t always open when you need them and sure enough, when we walked by again later, it was shut for the night. The director of the Camino Forum had sent us patches for our backpacks and they were waiting for us when we checked in. Suddenly, I felt calm, I felt at home, and I felt energized that I could do this. One of the real benefits of walking in December, is the Christmas markets. Some, like the one in Madrid, focus on all the little pieces that you can pull together to build your Nativity scene, or belén, and others, like the ones in Burgos or León, concentrate more on festivities or food. 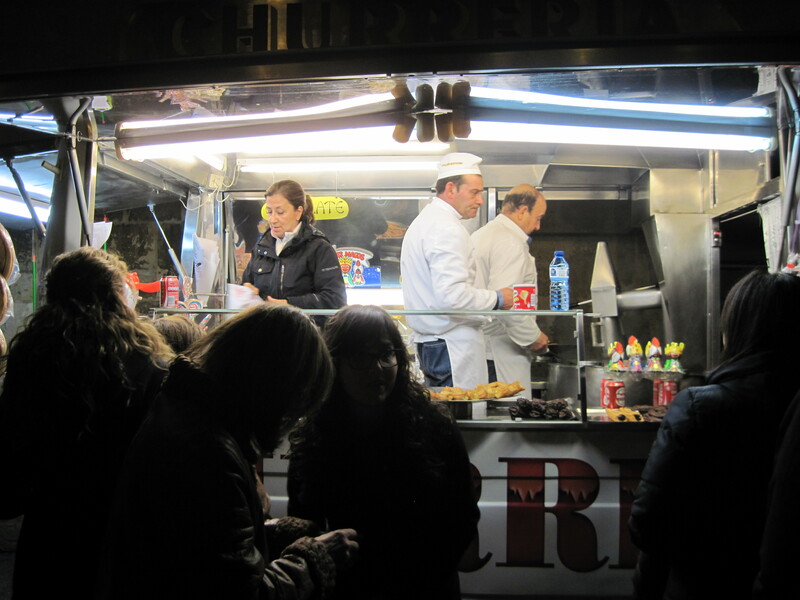 I had been to this one before and knew where to get the churros stuffed with creme and where to go to see the colorful pageants with the local dancers in costume. What an amazing way to start our Camino. 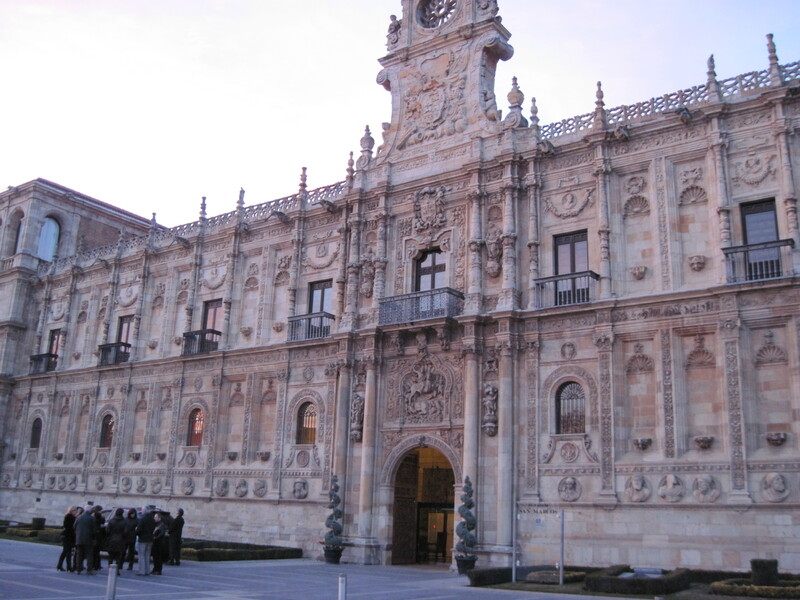 In the morning, we had breakfast in the parador and took a cab to a small town just outside the city – Virgen del Camino. The sun was not going to be up for another hour, but we were ready. I told my daughters that a journey of a thousand miles begins with a single step and we started walking in the morning fog – the three of us wearing matching black jackets. 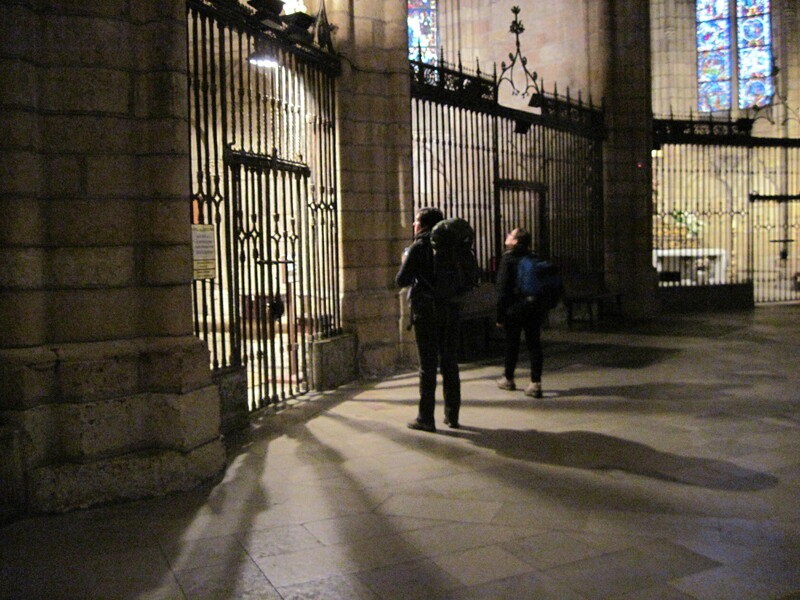 It would have been nice to have another cup of coffee at that wonderful hotel or to be able to offer another few prayers in the León Cathedral, but there is some kind of magnetic pull to this walk that defies description. When you need to do this, you do this. And little by little, with each milestone achieved, my girls and I became first, walkers, then pilgrims. After all, we don’t come to the Camino to sip coffee and our prayers are best said while we walk. Posted in Camino Frances. Tagged Camino, cathedral, leon, Spain.